This is how Peter Townsend introduced Poverty in the United Kingdom. A survey of household resources and standards of living (PUK) when it was published in 1979. In reality this massive book (over 1200 pages) and one of the most highly cited and influential ever written by an Essex sociologist set out an approach to the study of poverty and inequality that occupied Peter for the rest of his long career. No book has had a greater impact on how social scientists study poverty today or on the public understanding of its meaning and causation. But it’s not an easy read, and not just because of its length. It’s a complex work in progress rather than a finished item and, as Peter once remarked, it’s at least ‘four books in one’ (PTI 111) . An outline of its origins and gestation may help to explain this complexity. From PEP to PUK In the 1960s Peter, along with his close colleague Brian Abel-Smith, was widely credited with having ‘rediscovered poverty’ (since when, due in no mean degree to his own work, it has not been lost again) . From the early fifties it was believed that full employment and the post-war welfare state meant that inequality was reducing and poverty was now only a residual problem. In his earliest paper, written as a young researcher at Political and Economic Planning (PEP) in 1952 (PTR 136-47) , Peter challenged the shaky bases of this optimism for which there was little evidence beyond Rowntree’s third and least convincing study of poverty in York and some equally tendentious work on income distribution. His concern with how poverty was defined and measured dates from this time. After becoming a founding member of the Institute for Community Studies (ICS) in 1954, and then at the LSE from 1957 until he moved to Essex in 1963, he developed this initial foray. In two papers published in the British Journal of Sociology he firstly set out a critique of absolute measures of poverty linked to considerations of subsistence living, the basis for Rowntree’s studies which had been incorporated by Beveridge in his proposals for the post war welfare state. In the second paper he enunciated the definition that became central to PUK, ‘my main thesis is that both ‘poverty’ and ‘subsistence’ are relative concepts and that they can only be defined in relation to the material and emotional resources available at a particular time to the members either of a particular society or of different societies’ (PTR 148-69) . In 1965 Townsend and Abel-Smith published The Poor and the Poorest (PTR 170-90) which bought together an analysis of poverty and inequality in a critique of the post war assumption that the first had been all but abolished and the second was declining. It used government surveys of income and expenditure to show that poverty was increasing, even in an increasingly affluent welfare state. Influenced by Titmuss’s pathbreaking work on the ‘social division of welfare (Titmuss, 1958, 34-55, 1962), it also set out a wider definition of income, and hence a more realistic assessment of inequality, including for example capital assets as well as earned income. This was further elaborated in PUK. The Poor and the Poorest made an immediate public and political impact, the ‘rediscovery of poverty’ dates from its publication. At the end of The Poor and the Poorest the authors refer to new research into ‘the scope and nature of poverty or low levels of living in modern society’. This was the genesis of PUK whose birth pangs proved to be severe and protracted . The initial aim was ‘unprecedentedly ambitious’ (PUK 25), a national survey of poverty (whose costs were grossly underestimated) covering over 2000 households and over 6000 individuals within them and four local surveys which covered 1200 households and almost 4000 individuals. The questionnaire was a formidable document, covering 39 pages and taking on average 2 hours to complete covering housing and living facilities, employment, occupational facilities and fringe benefits, cash income, assets and savings, health and disability, social services, private income in kind and style of living. Its extent and complexity derived from the intent to define income much more widely, to measure consumption beyond the mere subsistence basis that Townsend had criticised as inadequate and to collect data on living styles, essential to any account of poverty defined sociologically and thus in relative terms. No comparably ambitious social survey had previously been attempted and it stretched the infant computing facilities at the University of Essex to the limit and also the analytical capacities of its principal author (Brian Abel Smith, an economist by training, had left the project at an early stage when he became government advisor) . 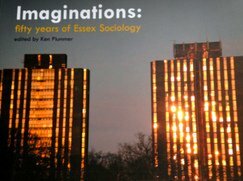 Peter’s move to Essex and his work as the founding professor of sociology (an appointment that later proved as inspiring as it was unexpected at the time) along with his central roles in the founding of the Child Poverty Action Group and the Disability Alliance made the difficulties of completing the research then writing PUK even more extreme. However it’s clear that during the decade it took to complete the project moved even beyond its initial ambitious aim to survey the state of poverty and inequality in the UK in the mid 1960s to locate poverty and inequality as inherent features of an unequal, class based society in which social policy served the needs of the powerful rather than the powerless and to argue for radical social reform as the path to ‘distributive justice for all’ . The resulting book which not only anatomises poverty and inequality but relates it to the social, political and bureaucratic structures of capitalism, a penetrating critique of the limits of the welfare state and the more briefly developed formulation of a socialist programme for reform maybe why Peter later described it as ‘four books in one’ . These interconnected but distinctive aspects of the work, not all fully developed, wind their way through the text and add to its enduring influence and value but also the sheer task of comprehension . PUK transcended the limits of a narrow, ameliorist and unrealistic definition of social policy (and how it should be studied), distant from the central sociological concerns of social structure, social divisions, class, and power . Anatomising poverty It is impossible here to summarise PUK in all its innovative complexity and scope. A (partial) outline of its key features is all that can be attempted. The book begins with a clear and frequently cited statement of its central thesis: ‘Poverty can be defined objectively and applied consistently only in terms of the concept of relative deprivation…Individual, families and groups…can be said to be in poverty when they lack the resources to obtain the types of diet, participate in the activities and have the living conditions and amenities which are customary, or at least widely encouraged and approved, in the societies to which they belong. Their resources are so seriously below those commanded by the average individual or family so that they are…excluded from ordinary living patterns, customs and activities’ . PUK aimed also to show that there was an objective, sociologically defined measure of poverty, a tipping point at which lack of resources led to a more than proportional decline in participation in these multi dimensional social norms. The work required by this remit explains the length of the questionnaire and, at least in part, the book. It involved obtaining information on the resources of household and individuals, not just cash income but also capital assets, occupational pensions, fringe benefits, social security benefits and income in kind. To locate households and individuals in the social structure it had to collect details of age, family structure, occupation/employment status, health/disability and so on. To measure deprivation in relation to the societal norm (the dimensions of which he elaborated largely a priori) Townsend collected data on housing and living conditions and developed a lengthy set of questions designed to assess respondents’ ability to participate or their exclusion from key features of generally shared consumption and participation, ‘whether members of the household participate in ordinary cultural and spare-time activities …and have ordinary diets’. In addition there were questions on attitudes to poverty and its causation. The data (including the four local studies) also allowed some sub-national analyses and there were some individual case studies of families in or on the margins of poverty which formed a separate, interesting but somewhat disconnected chapter in PUK. These data allowed him both to construct a multidimensional index of deprivation in order to explore the relationship between increasing deprivation and declining participation and the possibility of a tipping point, and to explore the separate but frequently interconnected varieties of deprivation and their relationship to locations in the social structure. There were several additional features of the questionnaire design which were important. Firstly the importance of collecting data on ‘minorities’, groups such as the elderly, disabled/sick, large and single parent families and so on, many of whom were difficult to survey but who were overrepresented among the poor. Any survey which missed them out would be virtually useless. Second was the need to distinguish between ‘total and partial poverty’, those whose living standards were uniformly deprived and those who were deprived in some significant aspects but not in others (for example low income workers living in decent conditions in council housing or those on somewhat higher incomes but in poor private rented housing). Finally the survey sought insofar as it could to collect information on people in long term poverty and those who experienced poverty for shorter periods (an ambition not fully realised until the British Household and other panel surveys many years later). PUK begins with two chapters that develop the earlier critique and reformulation of the concept and theory of poverty followed by a methodological chapter and a survey of trends in inequality and poverty between in the three decades up to the time of the survey in 1968-9. Then comes a chapter analysing the ‘concept and (unequal) distribution of resources’ and two chapters which draw on the survey to assess the overall incidence of poverty, tentatively suggesting that some of the data did indicate the hypothesised ‘break point’, and explore the demographic, social and regional variations in its incidence. The data is used to compute the scale of poverty when the state benefits rules were applied, when a relative income standard income less than 50% of the mean was applied and on basis of the relative poverty index. On the first measure 7% were in poverty, on the second 10.5% and on the third 25%. Following the chapter of case studies, PUK contains a pioneering examination of ‘the rich’, their styles of life and incomes. The purpose is not just to contrast all this with the condition of the poor but to develop the case that it is this group’s unequal command over resources generally and their power to sustain this situation that reinforces poverty and impedes the redistributive polices required for its elimination. It is fair to say that here and elsewhere the empirical research on which PUK is based is only partially supportive of the analysis. The more general relationships between social class and poverty are then explored as well as the disconcerting findings on attitudes to poverty among the survey respondents (the poor were only moderately less likely than the better off to blame the poor for their own condition, not perhaps good news for the prospects for radical reform although Townsend didn’t dwell on this). Most of the rest of the book analyses in compelling detail and depth the separate dimensions of deprivation. First there are four chapters on deprivation in work, in housing, on environmental deprivation and ‘the problems of poor areas’. Here as elsewhere PUK opens up wholly new and important topics and issues, for example the attempt to measure environmental deprivation and the arguments developed on the basis of concrete evidence against policies which focus on geographically defined clusters of poverty (as most poverty isn’t so concentrated). Then the analysis shifts to the ‘social minorities’. Overall PUK defines 13 groups and there are separate chapters on the un- and underemployed, the low paid, older workers, the disabled and long term sick, ‘handicapped’ children, one parent families and old people. In each case PUK examines their circumstances and the deficiencies of contemporary policies. These chapters defined the detailed landscape of poverty both for subsequent academic analysis and for pressure group and political activism. Two further chapters focus on the deficiencies of key features of the post war welfare state, covering the limitations of the Supplementary Benefit regime and the ‘failure of means tested benefits’. Townsend concludes that poverty is far more widespread than conventional wisdom admits and is produced and maintained by an unequal society. Social policy is not a benign influence working to reduce inequality and eliminate poverty but frequently supports and sustains these conditions. Those denied access to employment or more than subsistence benefits formed a kind of ‘modern underclass’. He argued that if poverty was to be ended the share of societal resources appropriated by the rich needed to be reduced and at the very end sketched out what would be needed for an ‘effective assault on poverty’ involving inter alia a drastic reduction of inequalities of income and wealth, the abolition of unemployment and curtailing managerial and bureaucratic power. In a massive understatement he concluded, ‘it would be wrong to suggest that any of it is easy or even likely’. PUK: early responses and its longer term impact Reading the first reviews of PUK it’s obvious that its size, scope and complexity were difficult to encompass. While its significance was acknowledged there was particular criticism of, for example, its methodology for constructing indices of deprivation and the not very persuasive evidence for the hypothesised ‘tipping point’ as well as the difficulties of combining a sociological issues of inequality and the social structure with value based definitions of poverty (Marshall 1981, Wedderburn 1981 and Piachaud 1981). A more sympathetic review noted the problems of threading a lifecycle analysis of poverty through a class based one and that the policy recommendations did not derive from the survey analysis but from a ‘larger political economy’ perspective (Miller and Tomaskovic-Devey 1981). In a notable exchange of views A.K.Sen argued for the continued relevance of absolute measures and definitions of poverty (PTR 227-51 contains a useful summary of the Piachaud and Sen critiques and Peter’s responses see also Wedderburn op cit). Peter responded robustly if not always completely convincingly to these and also addressed deficiencies such as the rather arbitrary nature of his indices of deprivation and definitions of normal life styles in later work with colleagues (see for example Gordon et al, 2000) . His tipping point hypothesis, at least in the form in which he formulated it, has not been borne out by the evidence, although a very recent analysis based on panel survey data does suggest a more subtle and perhaps initially counter intuitive form of inflection But, as I have already indicated at various points, and beyond these often perceptive criticisms, PUK’s seminal role in redefining the public and academic understanding of poverty, inequality and deprivation over the 35 years since its publication has been profound. Its concept of relative poverty has been widely accepted as the basis for subsequent academic work and has had a formative influence on work by among others the EU, OECD and the World Bank (to which Peter also made major contributions, see PTR 553-659). The links that it made between poverty and inequality, social structures and institutions, mechanisms for and patterns of resource allocation in society, power and class and the distinctive characteristics of the ‘minority groups’ set new agendas for theory, research and activism. The emphasis on studying poverty as a dynamic condition and the distinction between long term and short term poverty was also pathbreaking. C. Wright Mills (1970, 11) famously referred to the power of the sociological imagination ‘to use information and to develop lucid summations of what is going on in the world’. PUK shows a remarkable, creative sociological imagination at work. However, in the sphere of influence where Peter would most have wanted to have an impact – in government and especially within the Labour Party- and on the levels of poverty and inequality in Britain and the efforts of public policy to counter them, the record, as he indicated towards the end of his life, has been disappointing, but not entirely so. As was pointed out at the time (Wedderburn op cit) and subsequently, the publication of PUK in 1979 was deeply ironic, just 6 months after Mrs Thatcher came to power to deregulate, emaciate or destroy much of the social and economic infrastructure on which the hopes for ‘distributive justice’ for all would need to be built. At the same time wider economic forces, the complex of post Fordist transformations of the economy and the social structure also took their toll. As subsequent major studies of poverty and inequality in the UK (several of which Peter lead or contributed to) showed, by the time that the Conservatives left office in 1997 poverty and inequality were much higher than the year in which PUK was published. The record under Labour was better in parts but tried to combine a somewhat more progressive set of social policies (for instance the target to eliminate child poverty over 20 years and major investments in health and education) with a tolerance of increasing inequality and further market deregulation (an attempt to combine ‘competitiveness’ with ‘cohesion’, see Harloe 2000, Buck et al 2002). No coherent strategy for moving towards distributive justice for all was contemplated, although the Labour Government’s initial concerns with combating social exclusion and fears about the creation of an underclass bore the obvious if unacknowledged influence of PUK. In these years Peter’s influence within the Labour Party, evident in earlier times, was minimal, at a time when his international impact continued to grow . Labour’s final shift under Tony Blair, from Fabian reformism under Tony Blair, to embrace much of the agenda of neo liberalism defined by Thatcher meant that Peter’s agenda no longer had any significant political sponsors However, it has had a more positive legacy in the growth and impact of non-governmental organisations devoted to analysing and publicising the changing incidence of poverty and deprivation and in lobbying. A newly constituted set of institutions in civil society, significantly inspired by Peter’s work and his wider influence, has been formed outside the constraints of party politics. And yet – as Peter recognised – change on the scale he advocated (and beyond the scope of reformist pressure group politics) has neither proved ‘easy or even likely’. In 2012 (Aldridge et al) the Joseph Rowntree Trust published a new analysis of poverty and social exclusion. This showed significant changes in the composition of those in poverty over the previous two decades, such as the rise of in work poverty and the decline in pensioner poverty. Other changes included the growth of health inequalities and the massive contribution to poverty made by under and unemployment. One in six households were in poverty at any one time and one in three had had a spell in poverty in the past four years. Labour’s policies to reduce child poverty had only had a very modest impact up to 2010/11. Currently planned welfare cuts would only make the overall situation worse. And as David Gordon (one of Peter’s key collaborators at Bristol) wrote in a response to a government consultation on social mobility and child poverty, the coalition government was seemingly reviving ‘discredited theories from the 1960s and 1970s such as Cultural Deficit theory, problem families and theories of Transmitted Deprivation’ (all of whose inadequacies PUK had discussed). And congruent with such theories (and with the neoliberal project more generally) the social mobility strategy was focused on intergenerational rather than intragenerational mobility (Gordon 2011). Poverty in the United Kingdom is in many respects an untidy, unfinished and even exasperating book at times, a work in progress that was to continue to the end of Peter’s life. But its massive contribution to social science in the academy and as an active agent in society cannot be ignored or undervalued. Perhaps the 21st century needs another study of such scope and brilliance for the times we now live in. References Aldridge, H, et al (2012) Monitoring Poverty and Social Exclusion 2012, Joseph Rowntree Foundation, York. Buck, N. et al (2002) Working Capital. Life and Labour in Contemporary London, London, Routledge. Ferrangina, et al. (2013) Poverty, Participation and Choice. The Legacy of Peter Townsend, Joseph Rowntree Foundation, York. Glennerster, H. (1995) British Social Policy since 1945, Blackwell, Oxford. Gordon, D. (2011) Consultation Response: Social Mobility & Child Poverty Review, PSE, Bristol. Harloe, M. (2001) ‘Social justice and the city: the new “liberal formulation”’, International Journal of Urban and Regional Research 25(4), 889-97. Kynaston, D. (2013) Modernity Britain. Opening the Box 1957-9, London, Bloomsbury Marshall, T. (1981) ‘Review Article. Poverty or Deprivation?’ Journal of Social Policy, 10(1), 81-7. Miller, S.M. and Tomaskovic-Devey, D. (1981) ‘Review Symposium’, British Journal of Sociology 32(2), 266-72. Piachaud, D. (1981) ‘Peter Townsend and the Holy Grail’, New Society, September, 421. Titmuss, R. (1958) Essays on ‘the Welfare State, London, Allen & Unwin. ________ (1962) Income Distribution and Social Change, London, Allen & Unwin Townsend, P. (1979) Poverty in the United Kingdom. A Survey of Household Resources and Standards of Living, Harmondsworth, Penguin Books. Walker, A. Et al (eds.) (2010) The Peter Townsend Reader, Bristol, The Policy Press. Wedderburn, D. (1981) ‘Review Symposium’, British Journal of Sociology 32(2) 274-8. Wright Mills, C. (1970) The Sociological Imagination, Harmondsworth, Penguin Books.